Contemplating a kitchen renovation project? It's a great choice if you're trying to sell your home, because estimates put the return on investment for a kitchen remodel at 80 to 100 percent of the cost. That means that nearly every dollar you put into new cabinets, countertops, flooring and appliances will come back to you when you sell. Even if you're not planning to move anytime soon, a kitchen renovation is a great project to undertake. 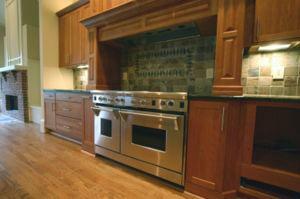 The kitchen is the heart of the home and appliances and accessories in the kitchen can really date it quickly. If you're still working with a kitchen straight out of the 1970s or 1980s, it's time for a revamp. Here are some things to think about when you remodel your kitchen. What do you use the space for? Sure, cooking is a big part, but if your family likes to hang out and do homework in the kitchen, you might want to add a breakfast nook or storage benches to your plan. What kind of cooking do you do? If you're a baker, you might consider a double oven. Other people might want a grill pan built into the stove top or even a built-in fryer. What's wrong with your current kitchen? Do you have enough storage? Do you even know what's in the back of some of those cupboards? Sometimes taking everything out of the cabinets and deciding what you really need to keep will give you a better storage plan. What's your budget? It's easy to go overboard on kitchen goodies, from stainless steel appliances to hand-painted backsplash tiles and marble countertops. But if you know you don't have the budget for all that, consider just refacing your cabinets, painting your appliances and replacing the flooring and countertops. Your kitchen will look great and you won't break the bank. Doing a kitchen renovation can be really frustrating because you still have to eat even when you have no countertop or the new oven hasn't been delivered. Sometimes hiring a contractor or handyman to help with the installation, even if you want to do some of it yourself, is a good idea because an extra set or two of hands makes every project go more smoothly.